Despite continuing press speculation fed by North Korea’s public pronouncements, recent commercial satellite imagery of the Sohae Satellite Launching Station (“Tongchang-ri”) indicates no sign yet of preparations for a launch on the upcoming 70th anniversary of the Workers’ Party of Korea (WPK) on October 10. In a September 14 interview with the Korean Central News Agency (KCNA), the Director of the National Aerospace Development Administration (NADA) asserted the DPRK’s right to peaceful space exploration, that “the world will clearly see a series of satellites soaring into the sky at the times and locations determined by the WPK Central Committee” and that scientists are working hard to celebrate the 70th anniversary “with greater scientific achievements.” These statements have been widely interpreted in the Western media to mean that the DPRK intends to launch a space launch vehicle (SLV) on October 10. 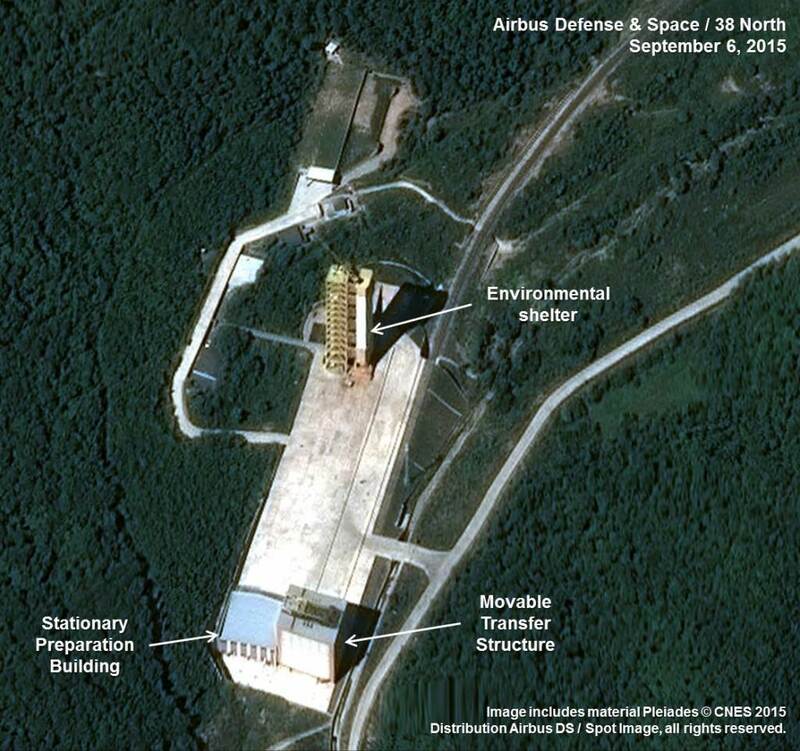 Imagery from September 6 shows little or no activity at the recently modernized Sohae facility, including the gantry tower and pad that was the site of the 2012 Unha SLV launches. The work platforms at the gantry tower are clearly enclosed by an environmental shroud. Determining whether that shroud is hiding an SLV is difficult, but seems unlikely. Figure 1. Sohae Launch Pad on September 6, 2015. Since the site was observed with only five weeks left before the October 10 anniversary, there remains little but possibly sufficient time for the North to prepare for a launch if Pyongyang follows past practices and procedures. An important caveat is that the SLV stages will have had to already undergone a “checkout” process that previously took place at the Sohae large horizontal assembly building and was observable by commercial satellite. However, observation has become more difficult given recent construction of a new processing facility at the east end of the launch pad and concealment measures such as the underground rail spur leading to the pad and the Movable Transfer Structure that would move the SLV components to the gantry tower. If the “checkout process” has not started, then a launch in mid-October is unlikely. If a launch is in the works and past practice is any guide, we would soon expect to see increased activity throughout the Sohae launch site. Such activity would include the filling of the propellant buildings near the launch pad as well as new activity at the instrumentation site, VIP housing and new launch control center.